Japanese sake is brewed according to a method unique and original to Japan. In general, the term Japanese sake refers to Seishu (refined sake), which is brewed from rice, rice malt, and water as primary materials. 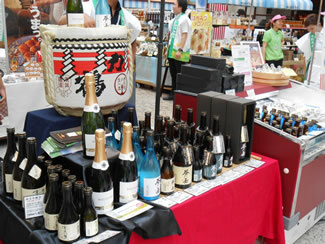 Of late, however, Japanese sake has been very popular among people living outside of Japan. So, how about taking a bottle of sake as a gift with you when you return to your home country? Gunma is surrounded by a rich natural environment and is the home of clear water, which is one of the keys to brewing tasty sake. Sake brewed by methods indigenous to each locality has been handed down through generations, and it gives sake the taste of its climate. Locally-brewed sake in Gunma is tasty, and it offers good so-called Nodogoshi (the feeling of a drink going down your throat) at the same time.